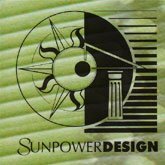 Sunpower Design are a leading company in integrated sustainable building design with 25 years experience and over 30 National and State awards for energy efficiency and sustainable design. They specialise in designing homes that are extremely comfortable and way exceed the energy performance levels of 5 Star Rated design. Sustainable features such as rainwater collection, alternative power sources, grey water recycling, solar hot water and water efficient landscaping integrated into the fabric of the design. Sunpower Design can also provide support during construction by working closely with the builder to maximize a smooth flowing process is also offered. New homes achieve a minimum of 6 Star Rating. Consultancy services are also available to architects and building designers on integrating energy efficient design and sustainable systems. This page was last modified 05:36, 3 May 2007.